Protect against expensive air conditioner unit replacement due to thieves destroying your HVAC for a few hundred dollars worth of copper. Lockable hinged all welded steel security cages prevent damage but allow access for maintenance. Tankless water heaters have valuable copper tubing and parts that get extremely hot. The Tankless Water Heater cage protects against vandals and against burns by keeping people away from the water heater completely. The hinged front access door is secured with two sturdy locks for ease of maintenance. Hinders would-be precious metal thieves from taking expensive copper components, saving thousands in repair and replacement costs. Lockable maintenance panel allows access for repairs and replacement. Mounts to most walls including concrete, wood and composite. Utility boxes tend to invite vandalism and metal theft because easy access to controls and copper wiring inside. 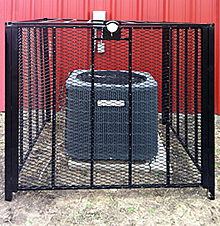 Protect important utility systems with Lockable steel security cages that anchor to the building. Front panel swings open for maintenance access. Backflow preventers with brass and copper fittings are easy for metal thieves to cut off in just minutes. Keep expensive systems safe by enclosing backflow preventers inside sturdy lockable steel security cages anchored firmly into the ground. Metal theft has reached epidemic proportions in the United States. Thieves rip copper parts out of air conditioners, steal plumbing pipe from day care centers, strip wiring from lighting fixtures at Little League ball parks and target construction sites for spools of copper wiring and other metals. Churches are frequent targets. Between 2002 and 2007, reports of metal thefts spiked almost 1000 percent, reaching an all time high of 3,339 per year in Dallas, TX alone. In 2008, Dallas averaged more than 300 metal thefts a month. Despite lower metal market prices, in 2010 thefts still averaged 130 reports a month - or about 4 every day. AT&T reports that the cost of repairing service cuts due to metal theft was $7.3 million in 2008. Cell phone towers are being stripped of wiring, bringing service down. Tornado warning sirens were hit in Jackson, Mississippi. Thieves are striking at sub-stations in order to get at copper coils in transformers. Don't let your utility connections and air conditioning systems become prey to metal thieves. Make your system a hard target to hit so that thieves will move on to an easier target. Secure them with hard to cut through steel security cages made from a welded steel angle framework and paneled with 1/2" expanded steel wire mesh - too small to get wire cutters through and too tough to crush or dismantle.